I resort to Mahalakshmi, the destroyer of Mahisasura, who is seated on the lotus, is of the complexion of coral and who holds in her (eighteen ) hands rosary, axe, mace, arrow, thunderbolt, lotus, bow, pitcher, rod, sakti, sword, shield, conch, bell, wine-cup, trident, noose and the discus Sudarsana. 1-3. Of yore when Mahisasura was the lord of asuras and Indra the lord of devas, there was a war between the devas and asuras for a full hundred years. In that the army of the devas was vanquished by the valorous asuras. After conquering all the devas, Mahisasura became the lord of heaven( Indra). 4-5. Then the vanquished devas headed by Brahma, the lord of beings, went to the place where Siva and Vishnu were. The devas described to them in detail, as it had happened, the story of their defeat wrought by Mahisasura. 9. Having thus heard the words of the devas, Vishnu was angry and also Siva, and their faces became fierce with frowns. 10-11. The issued forth a great light from the face of Vishnu who was full of intense anger, and from that of Brahma and Siva too. From the bodies of Indra and other devas also sprang forth a very great light. And (all) this light united together. 12-13. The devas saw there a concentration of light like a mountain blazing excessively, pervading all the quarters with its flames. Then that unique light, produced from the bodies of all the devas, pervading the three worlds with its lustre, combined into one and became a female form. 14-15. By that which was Siva's light, her face came into being; by Yama's (light) her hair, by Vishnu's light her arms; and by Candra's (light) her two breasts. By Indra's light her waist, by Varuna's (light) her shanks and thighs and by earth's light her hips. 16-18. By Brahma's light her feet came into being; by Surya's light her toes, by Vasus (light) her fingers, by Kubera's (light) her nose; by Prajapati's light her teeth came into being and similarly by Agni's light her three eyes were formed. The light of the two sandhyas became her eye-brows, the light of Vayu her ears; the manifestation of the lights of other devas too (contributed to the being of the ) auspicious Devi. 19. Then looking at her, who had come into being from the assembled lights of all the devas, the immortals who were oppressed by Mahisasura experienced joy. 20-21. The bearer of Pinaka (Siva) drawing forth a trident from his own trident presented it to her; and Vishnu bringing forth a discus out of his own discus gave her. Varuna gave her a conch, Agni a spear; and Maruta gave a bow as well as two quivers full of arrows. 22-23. Indra, lord of devas, bringing forth a thunderbolt out of (his own) thunderbolt and a bell from that of his elephant Airavata, gave her. Yama gave a staff from his own staff of Death and Varuna, the lord of waters, a noose; and Brahma, the lord of beings, gave a string of beads and a water-pot. 24. Surya bestowed his own rays on al the pores of her skin and Kala (Time) gave a spotless sword and a shield. 25-29. The milk-ocean gave a pure necklace, a pair of un-decaying garments, a divine crest-jewel, a pair of ear-rings, bracelets, a brilliant half-moon(ornament), armlets on all arms, a pair of shining anklets, a unique necklace and excellent rings on all the fingers. Visvakarman gave her a very brilliant axe, weapons of various forms and also an impenetrable armour. The ocean gave her a garland of unfading lotuses for her head and another for her breast, besides a very beautiful lotus in her hand. The (mountain) Himavat hve her a lion to ride on a various jewels. 30-33. The lord of wealth (Kubera) gave her a drinking cup, ever full of wine. Sesa, the lord of all serpents, who supports this earth, gave her a serpent-necklace bedecked with best jewels. Honoured likewise by other devas also with ornaments and weapons, she (the Devi) gave out a loud roar with a decrying laugh again and again. By her unending, exceedingly great, terrible roar the entire sky was filled, and there was great reverberation. All worlds shook, the seas trembled. 34-46. The earth quaked and all the mountains rocked. 'Victory to you,' exclaimed the devas in joy to her, the lion-rider. The sages, who bowed their bodies in devotion, extolled her. Seeing tethree worlds agitated the foes of devas, mobilized all their aries and rose up together with uplifted weapons. Mahisasura, exclaiming in wrath, 'Ha! What is this?' rushed towards that roar, surrounded by innumerable asuras. Then he saw the Devi pervading the three worlds with her lustre. Making the earth bend with her footstep, scraping the sky with her diadem, shaking the nethr wrlds with the twang of the bowstring, and standing here pervading all the quarters around with her thousand arms. Then began a battle between that Devi and the enemies of the devas, in wich the quarters of the sky were illumined by the weapons and arms hurled diversely. Mahisasura's general, a great asura named Ciksura and Camara, attended by forces comprising four parts, and other (asuras) fought. A great asura named Udagra with sixty thousand chariots, and Mahahanu with ten millions (of chariots) gave battle. Asiloman, another great asura, with fifteen millions (of chariots), and Baskala with six millions fought in that battle. Privarita with many thousands of elephants and horses, and surrounded by ten millions of chariots, fought in that battle. An asura named Bidala fought in that battle surrounded with five hundred crores of chariots. And other great asuras, thousands in number, surrounded with chariots, elephants and horses fought with the Devi in that battle. 47-48. Mahisasura was surrounded in that battle with thousands of crores of horses, elephants and chariots. Others (asuras) fought in the battle against the Devi with iron maces and javelins, with spears and clubs, with swords, axes and halberds. Some hurled spears and others nooses. smashed by the blows of her mace, lay down on the ground; and some severely hammered by club vomited forth blood. 59-61. Pierced in the breast by her trident, some fell on the ground. Pierced all over by her arrows and resembling porcupines, some of the enemies of devas gave up their lives on that field of battle. Some had their arms cut off, some, their necks broken the heads of others rolled down; some others were torn asunder in the middle of their trunks, and some great asuras fell on the ground with their legs severed. 62. Some rendered one-armed, one-eyed, and one-legged were again clove in twain by the Devi. And others, though rendered headless, fell and rose again. 63. Headless trunks fought with the Devi with best weapons in their hands. Some of these headless trunks danced there in the battle to the rhythm of the musical instruments. 64-65. The trunks of some other great asuras, with their swords, spears and lances still in their hands, shouted at the Devi with their just severed heads, 'Stop, stop'. That part of earth where the battle was fought became impassable with the asuras, elephants and horses and chariots that had been felled. 66-67. The profuse blood from the asuras, elephants and horses flowed immediately like large rivers amidst that army of the asuras. As fire consumes a huge heap of straw and wood, so did Ambika destroy that vast army of asuras in no time. 68-69. And her carrier-lion, thundering aloud with quivering mane, prowled about in the battlefield, appearing to search out the vital breaths from the bodies of the enemies of devas. In that battlefield the battalions of the Devi fought in such a manner with the asuras that the devas in heaven, showering flowers, extolled them. Here ends the second chapter called 'Slaughter of the armies of Mahisasura' of Devi-mahatmya in Markandeya-purana, during the period of Savarni, the Manu. 1-2. Then Ciksura, the great asura general, seeing that army being slain(by the Devi), advanced in anger to fight with Ambika. 3. That asura rained showers of arrows on the Devi in the battle, even as a cloud (showers) rain on the summit of Mount Meru. 4. Then the Devi, easily cutting asunder the masses of his arrows, killed his horses and their controller with her arrows. 5. Forthwith she split his bow and lofty banner, and with her arrows pierced the body of that(asura) whose bow had been cut. 6. His bow shattered, his chariot broken, his horses killed and his charioteer slain, the asura armed with sword and shield rushed at the Devi. 7. Swiftly he smote the lion on the head with his sharp-edged sword and struck the Devi also on her left arm. 8. O king, his sword broke into pieces as it touched her arm. Thereon his eyes turning red with anger, he grasped his pike. 9. Then the great asura flung at Bhandrakali the pike, blazing with lustre, as if he was hurling the very sun from the skies. 10. Seeing that pike coming upon her, the Devi hurled her pike that shattered his pike into a hundred fragments and the great asura himself. 11. Mahisasura's very valiant general having been killed, Camara, the afflictor of devas, mounted on an elephant, advanced. 12. He also hurled his spear at the Devi. Ambika quickly assailed it with a whoop, made it lustreless and fall to the ground. 13. Seeing his spear broken and fallen, Camara, full of rage, flung a pike, and she split that also with her arrows. 14. Then the lion, leaping up and seating itself at the centre of the elephant's forehead, engaged itself in a hand to hand fight with that foe of the devas. 15. Fighting, the two then came down to the earth from the back of the elephant, and fought very impetuously, dealing the most terrible blows at each other. 16. Then the lion, springing up quickly to the sky, and descending,severed Camara's head with a blow from its paw. 17. And Udagra was killed in the battle by the Devi with stones, trees and the like, and Karala also stricken down by her teeth and fists and slaps. 18. 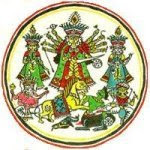 Enraged, the Devi ground Uddhata to powder with the blows of her club, and killed Baskala with a dart and destroyed Tamra and Andhaka with arrows. 19. The three-eyed Supreme Isvari killed Ugrasya and Ugravirya and Mahahanu also with her trident. 20. With her sword she struck down Bidala's head from his body, and dispatched both Durdhara and Durmudha to the abode of Death with her arrows. 21. As his army was thus being destroyed, Mahisasura terrified the troops of the Devi with his own buffalo form. 22. Some ( he laid low) by a blow of his muzzle, some by stamping with his hooves, some by the lashes of his tail, and others by the pokes of his horns. 23. Some he laid low on the face of the earth by his impetuous speed, some by his bellowing and wheeling movement, and others by the blast of his breath. 24. Having laid low her army, Mahisasura rushed to slay the lion of the Mahadevi. This enraged Ambika. 25. Mahisasura, great in valour, pounded the surface of the earth with his hooves in rage, tossed up the high mountains with his horns, and bellowed terribly. 26. Crushed by the velocity of his wheeling, the earth disintegrated, and lashed by his tail, the sea overflowed all around. 27. Pierced by his swaying horns, the clouds went into fragments. Cast up by the blast of his breath, mountains fell down from the sky in hundreds. 28. Seeing the great asura swollen with rage and advancing towards her,Chandika displayed her wrath in order to slay him. 29. She flung her noose over him and bound the great asura. Thus bound in the great battle, he quitted his buffalo form. 30. Then he became a lion suddenly. While Ambika cut off the head (of his lion form), he took the appearance of a man with sword in hand. together with his sword and shield. Then he became a big elephant. 32. (The elephant) tugged at her great lion with his trunk and roared loudly, but as he was dragging, the Devi cut off his trunk with her sword. 33. The great asura then resumed his buffalo shape and shook the three worlds with their movable and immovable objects. 34. Enraged threat, Chandika, the Mother of the worlds, quaffed a divine drink again and again, and laughed, her eyes becoming red. 35, And the asura, also roared intoxicated with his strength and valour, and hurled mountains against Chandika with his horns. 36. And she with showers of arrows pulverized ( those mountains) hurled at her, and spoke to him in flurried words, the colour of her face accentuated with the intoxication of the divine drink. 39-40. Having exclaimed thus, she jumped and landed herself on that great asura, pressed him on the neck with her foot and struck him with her spear. 41. And thereupon, caught up under her foot. Mahisasura half issued forth ( in his real form) from his own (buffalo) mouth, being completely overcome by the valour of the Devi. 42. Fighting thus with his half-revealed form, the great asura was laid by the Devi who struck off his head with her great sword. 43. Then, crying in consternation, the whole asura army perished; and all the hosts of deva were in exultation. 44. With the great sages of heaven, the devas praised the Devi. The Gandharva chiefs sang and the bevies of apsaras danced. Here ends the third chapter called 'The Slaying of Mahisasura' of Devi-mahatmya in Markandeya-purana during the period of Savarni, the Manu. 1-2. When that most valiant but evil-natured Mahisasura and the army of that foe of the devas were destroyed by the Devi, Indra and the hosts of devas uttered their words of praise, their necks and houlders reverently bent, and bodies rendered beautiful with horripilation and exultation. 3. 'To that Ambika who is worthy of worship by all devas and sages and pervades this world by her power and who is the embodiment of the entire powers of all the hosts of devas, we bow in devotion. May she grant us auspicious things! 4. 'May Chandika, whose incomparable greatness and power Bhagavan Vishnu, Brahma and Hara are unable to describe, bestow her mind on protecting the entire world and on destroying the fear of evil. 5. ' O Devi, we bow before you, who are yourself good fortune in the dwellings of the virtuous, and ill-fortune in those of the vicious, intelligence in the hearts of the learned, faith in the hearts of the good, and modesty in the hearts of the high-born. May you protect the universe! 6. 'O Devi, how can we describe your inconceivable form, or your abundant surpassing valour that destroys the asuras, or your wonderful feats displayed in battles among all the hosts of gods, asuras and others? 7. 'You are the origin of all the worlds! Though you are possessed of the three gunas you are not known to have any of their attendant defects(like passion)! You are incomprehensible even to Vishnu, Shiva and others! You are the resort of all! this entire world is composed of an infinitesimal portion of yourself! You are verily the supreme primordial Prakriti untransformed. 8. 'O Devi, you are Svaha at whose utterance the whole assemblage of gods attains satisfaction in all the sacrifices. You are the Svadha which gives satisfaction to the manes. Therefore you are chanted (as Svaha and Svadha in Sacrifices) by people. 9. 'O Devi, you are Bhagavati, the supreme Vidya which is the cause of liberation, and great inconceivable penance (are the means for your realization). You ( the supreme knowledge) are cultivated by sages desiring liberation, whose senses are well restrained, who are devoted to Reality, and have shed all the blemishes. 10. 'You are the soul of Sabda-Brahman. You are the repository of the very pure Rig-veda and Yajus hymns, and of Samans, the recital of whose words is beautiful sith the Udgitha! You are Bhagavati embodying the three Vedas. And you are the sustenance whereby life is maintained. You are the supreme destroyer of the pain of al the worlds. 11. 'O Devi, you are the Intellect, by which the essence of all scriptures is comprehended. 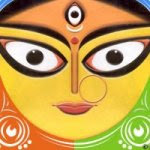 You are Durga, the boat that takes men across the difficult ocean of worldly existence, devoid of attachments. You are Shri who has invariably taken her abode in the heart of Vishnu. You are indeed Gauri who has established herself with Shiva. 12. 'Gently smiling, pure, resembling the full moon's orb, beautiful like the splendour of excellent gold was your face! Yet it was very strange that, being swayed by anger, Mahisasura suddenly struck your face when he saw it. 13. 'Far strange it is that after seeing your wrathful face, O Devi, terrible with its frowns and red in hue like the rising moon, that Mahisasura did not forthwith give up his life! For, who can live after beholding the enraged Destroyer? 14. 'O Devi, be propitious. You are Supreme. If enraged, you forthwith destroy the (asura) families for the welfare (of the world). This was known the very moment when the extensive forces of Mahisasura were brought to their end. 15. 'You who are always bounteous, with whom you are well pleased, those (fortunate ones) are indeed the object of esteem in the country, theirs are riches, theirs are glories, and their acts of righteousness perish not; they are indeed blessed and possessed of devoted children, servants and wives. 16. 'By your grace, O Devi, the blessed individual does daily all righteous deeds with utmost care and thereby attains to heaven. Are you not, therefore O Devi, the bestower of reward in all the three worlds? 17. 'When called to mind in a difficult pass, you remove fear for eve3ry person. When called to mind by those in happiness, you bestow a mind still further pious. Which goddess but you, O Dispeller of poverty, pain and fear, has an ever sympathetic heart for helping everyone? 18. 'The world attains happiness by the killing of these (foes) and though these (asuras) have committed sins to keep them long in hell, let them reach heaven by meeting death eventually at he battle (with me)- thinking thus, that you, O Devi, certainly destroy our enemies. 19. 'Don't' you reduce to ashes all asuras by mere sight? But you direct your weapons against them so that even the inimical ones, purified by the missiles, may attain the higher worlds. Such is your most kindly intention towards them. 20. 'If the eyes of the asuras had not been put out by the terrible flashes of the mass of light issuing from your sword or by the copious lustre of your spearpoint, it is because they saw also your face resembling the moon, giving out (cool) rays. 21. 'O Devi, your nature is to subdue the conduct of the wicked; this your peerless beauty is inconceivable for others; your power destroys those who have robbed the devas of their prowess, and you have thus manifested your compassion even towards the enemies. 22. 'What is your prowess to be compared to? Where can one find this beauty (of yours) most charming, (yet) striking fear in enemies? Compassion in heart and relentlessness in battle are een, O Devi, O Bestower of boons, only in you in all the three worlds! 23. 'Through the destruction of the enemies all these three worlds have been saved by you. Having killed them in the battle-front, you have led even those hosts of enemies to heaven, and you have dispelled our fear from the frenzied enemies of the devas. Salutation to you! 24. 'O Devi, protect us with your spear. O Ambika, protect us with your sword, protect us by the sound of your bell and by the twang of your bow-string. 25. 'O Chandika, guard us in the east, in the west, in the north and in the south by the brandishing of your spear. O Iswari! 26. 'Protect us and the earth with those lovely forms of yours moving about in the three worlds, as also with your excludingly terrible forms. 28-30. Thus the supporter of the worlds was praised by the devas, worshipped with celestial flowers that blossomed in Nandana and with perfumes and unguents; and with devotion all of them offered her - heavenly incense. Benignly serene in countenance she spoke to all obeisant devas. 33-34. 'Since our enemy, this Mahisasura, has been slain by Bhagavati (i.e you) everything has been accomplished, and nothing remains to be done. 35. 'And if a boon is to be granted to us by you, O Mahesvari, whenever we think of you again, destroy our direct calamities. 38-39. O King, being thus propitiated by the devas for the sake of the world and for their own sake, Bhadrakali said, 'Be it so' and vanished from their sight. 40. Thus have I narrated, O King, how the Devi who desires the good of all the three worlds made her appearance of yore out of the bodies ofthe devas. 41-42. And again how, as a benefactress of the devas, she appeared in the form of Gauri for the slaying of wicked asuras as well as Sumbha and Nisumbha, and for the protection of worlds, listen as I relate it. I shall tell it to you as it happened. Here ends the fourth chapter called "the Hymn of the Devi" of the Devi-mahatmya in Markandeya-purana during the period of Savarni, the Manu. 1-2. Then at his command the asuras, fully armed, and with Chanda and Munda at their head, marched in fourfold array. 3. They saw the Devi, smiling gently, seated upon the lion on a huge golden peak of the great mountain. 4. On seeing her, some of them excited themselves and made an effort to capture her, and others approached her, with their bows bent and swords drawn. 5. Thereupon Ambika became terribly angry with those foes, and in her anger her countenance then became dark as ink. 6. 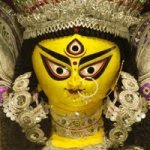 Out from the surface of her forehead, fierce with frown, issued suddenly Kali of terrible countenance, armed with a sword and noose. 7-9. Bearing the strange skull-topped staff, decorated with a garland of skull, clad in a tiger's skin, very appalling owing to her emaciated flesh, with gaping mouth, fearful with her tongue lolling out, having deep-sunk reddish eyes and filling the regions of the sky with her roars, and falling upon impetuously and slaughtering the great asuras in that army, she devoured those hosts of the foes of the devas. 10. Snatching the elephants with one hand she flung them into her mouth together with their rear men and drivers and their warrior-riders and bells. 11. Taking likewise into her mouth the cavalry with the horses, and chariot with its driver, she ground them most frightfully with her teeth. 12. She seized one by the hair and another by the neck; one she crushed by the weight of the foot, and another of her body. 13. And she caught with her mouth the weapons and the great arms shot by those asuras and crunched them up with her teeth in her fury. 14. She destroyed all that host of mighty and evil-natured asuras, devoured some and battered others. 15. Some were killed with her word, some were beaten with her skull-topped staff, and other asuras met their death being ground with the edge of her teeth. 16. 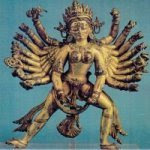 On seeing all the hosts of asuras laid low in a moment, Chanda rushed against that Kali, who was exceedingly terrible. 17. The great asura (Chanda) with very terrible showers of arrows, and Munda with discuses hurled in thousands covered that terrible-eyed(Devi). 18. Those numerous discuses, disappearing into her mouth, looked like numerous solar orbs disappearing into the midst of a cloud. 19. Thereat Kali, who was roaring frightfully, whose fearful teeth were gleaming within her dreadful mouth, laughed terribly with exceeding fury. 20. Then the Devi, mounting upon her great lion, rushed at Chanda, and seizing him by his hair, severed his head with her sword. 21. Seeing Chanda laid low, Munda also rushed at her. She felled him also the ground, striking him with her sword in her fury. 22. Seeing the most valiant Chanda and Munda laid low, the remaining army there became panicky and fled in all directions. 23. And Kali, holding the heads of Chanda and Munda in her hands, approached Chandika and said, her words mingled with very loud laughter. 25-27. Thereupon seeing those asuras, Chanda and Munda brought to her, the auspicious Chandika said to Kali these playful words: 'Because you have brought me both Chanda and Munda, you O Devi, shall be famed in the world by the name Chamunda. Here ends the seventh chapter called 'The slaying of Chanda and Munda' of Devi-mahatmya in Markandeya purana, during the period of Savarni, theManu. 4. 'Now let the eighty-six asuras - upraising their weapons - with all their forces, and the eighty-four Kambus, surrounded by their own forces, go out. 5. 'Let the fifty asura families of Kotiviryas and the hundred families of Dhaumras go forth at my command. 7. After issuing these orders, Sumbha, the lord of the asuras and a ferocious ruler, went forth, attended by many thousands of big forces. 8. Seeing that most terrible army coming, Chandika filled into space between the earth and the sky with the twang of her bow-string. 9. 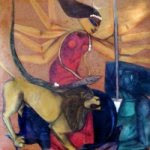 Thereon her lion made an exceedingly loud roar, O King, and Ambika magnified those roars with the clanging of the bell. 10. Kali, expanding her mouth wide and filling the quarters with the sound (hum ) overwhelmed the noises of her bow-string, lion and bell by her terrific roars. 11. On hearing that roar the enraged asura battalions surrounded the lion, the Devi (Chandika) and Kali on all the four sides. 12-13. At this moment, O King, in order to annihilate the enemies of devas and for the well-being of the supreme devas, there issued forth, endowed with exceeding vigour and strength, Shaktis from the bodies of Brahma, Shiva, Guha, Vishnu and Indra, and with the form of those devas went to Chandika. 14. Whatever was the form of each deva, whatever his ornaments and vehicle, in that very form his Shakti advanced to fight with the asuras. 15. In a heavenly chariot drawn by swans advanced Brahma's Shakti carrying a rosary and Kamandalu. She is called Brahmani. 16. Maheshvari arrived, seated on a bull, holding a fine trident, wearing bracelets of great snakes and adorned with a digit of the moon. 17. Ambika Kaumari, in the form of Guha, holding a spear in hand riding on a fine peacock, advanced to attack the asuras. 18. Likewise the Shakti of Vishnu came, seated upon Garuda, holding conch, club, bow and sword in hand. 19. The Shakti of Hari, who assumed the incomparable form of a sacrificial boar, she also advanced there in a boar-like form. 20. Narasmihi arrived there, assuming a body like that of a Narasmiha, bringing down the constellations by the toss of her mane. 21. Likewise the thousand-eyed Aindri, holding a thunderbolt in hand and riding on the lord of elephants arrive just like Sakra (Indra). 23. Thereupon from the body of Devi issued forth the Shakti of Chandika, most terrific, exceedingly fierce and yelling like a hundred jackals. 24. And that invincible (Shakti) told Shiva, of dark coloured matted locks, 'Go, my lord, as ambassador to the presence of Sumbha and Nisumbha. 25. 'Tell the two haughty asuras, Sumbha and Nisumbha, and the other asuras assembled there for battle. 26. "Let Indra obtain the three worlds and let the devas enjoy the sacrificial oblations. You go to the nether world, if you wish to live. 28. Because that Devi appointed "Shiva" himself as ambassador thenceforth she became renowned in this world as Shiva-duti. 29. Those great asuras, on their part, hearing the words of the Devi communicated by Shiva, were filled with indignation and went where Katyayani stood. 30. Then in the very beginning, the enraged foes of the devas poured in front on the Devi showers of arrows, javelins and spears. 31. And lightly, with the huge arrows shot from her full-drawn bow, she clove those arrows, spears, darts and axes hurled by them. 32. Then, in front of him (Sumbha), stalked Kali, piercing the enemies to pieces with her spear and crushing them with her skull-topped staff. 33. And Brahmani, wherever she moved, made the enemies bereft of valour and prowess by sprinkling on them the water from her Kamandalu. 34. The very wrathful Maheshvari slew the daityas with her trident, and Vaisnavi, with her discus and Kaumari, with her javelin. 35. Torn to pieces by the thunderbolt which come down upon them, hurled by Aindri, daityas and danavas fell on the earth in hundreds, streams of blood flowing out of them. 36. Shattered by the boar-formed goddess (Varahi)with blows of her snout, wounded in their chests by the point of her tusk and torn by her discus, (the asuras) fell down. 37. Narasmihi, filling all the quarters and the sky with her roars, roamed about in the battle, devouring other great asuras torn by her claws. 38. Demoralised by the violent laughter of Shivaduti, the asuras fell down on the earth; she then devoured them who had fallen down. 39. Seeing the enraged band of Matrs crushing the great asuras thus by various means, the troops of the enemies of devas took to their heels. 40. Seeing the asuras harassed by the band of Matrs and fleeing, the great asura Raktabija strode forward to fight in wrath. 41. Whenever from his body there fell to the ground a drop of blood, at that moment rose up from the earth asura of his stature. 42. The great asura fought with Indra's shakti with club in his hand; then Aindri also struck Ranktabija with her thunderbolt. 44. As many drops of blood fell from his body, so may persons came into being, with his courage, strength and valour. 45. And those persons also sprung up from his blood fought there with the Matrs in a more dreadful manner hurling the very formidable weapons. 46. And again when his head was wounded by the fall of her thunder-bolt, his blood flowed and therefrom were born persons in thousands. 47. Vaisnavi struck him with her discus in the battle, Aindri beat that lord of asuras with her club. 48. The world was pervaded by thousands of great asuras who were of his stature and who rose up from the blood that flowed from him when cloven by the discus of Vaisnavi. 49. Kaumari struck the great asura Raktabija with her spear, Varahi with her sword, and Mahesvari with her trident. 50. And Raktabija, that great asura also, filled with wrath, struck everyone of the Matrs severally with his club. 51. From the stream of blood which fell on the earth from him when he received multiple wounds by the spears, darts and other weapons, hundreds of asuras came into being. 52. And those asuras that were born from the blood of Raktabija pervaded the whole world; the devas got intensely alarmed at this. 53-54. Seeing the devas dejected, Chandika laughed and said to Kali, 'O Chamunda, open out your mouth wide; with this mouth quickly take in the drops of blood generated by the blow of my weapon and (also) the great asuras born of the drops of blood of Raktabija. 55. 'Roam about in the battle-field, devouring the great asuras that spring from him. So shall this daitya, with his blood emptied, perish. 57. Then Kali drank Raktabija's blood with her mouth. Then and there he struck Chandika with his club. 58-60. The blow of his club caused her not even the slightest pain. And from his stricken body wherever blood flowed copiously, there Chamunda swallowed it with her mouth. The Chamunda devoured those great asuras who sprang up from the flow of blood in her mouth, and drank his (Raktabija's ) blood. 61. The Devi (Kausiki) smote Raktabija with her dart, thunderbolt, arrows, swords, and spears, when Chamunda went on drinking his book. 62. Stricken with a multitude of weapons and bloodless, the great asura (Raktabija) fell on the ground, O King. 63. Thereupon the devas attained great joy, O King. The band of Matrs who sprang from them dance, being intoxicated with blood. Here ends the eighth chapter called 'The Slaying of Raktabija' of Devi-mahatmya in Markandeya-purana, during the period of Savarni, the Manu. 1-2. 'Wonderful is this that you, adorable sir, have related to me about the greatness of the Devi's act in slaying Raktabija. 4-5. After Raktabija was slain and other asuras were killed in the fight, the asura Sumbha and Nisumbha gave way to unbounded wrath. 6. Enraged on seeing his great army slaughtered, Nisumbha then rushed forward with the chief forces of the asuras. 7. In front of him behind him and on both sides of him, great asuras, enraged and biting their lips, advanced to slay the Devi. 8. Sumbha also, mighty in valour, went forward, surrounded, with his own troops to slay Chandika in this rage, after fighting with the Matrs. 9. Then commenced severe combat between the Devi on one side and on the other, Sumbha and Nisumbha who, like two thunder-clouds, rained a most tempestuous shower of arrows on her. 10. Chandika with numerous arrows quickly split the arrows shot by the two asuras and smote the two lords of asuras on their limbs with her mass of weapons. 11. Nisumbha, grasping a sharp sword and a shining shield, struck the lion, the great carrier of the Devi on the head. 12. When her carrier was struck, the Devi quickly cut Nisumbha's superb sword with a sharp-edged arrow and also his shield on which eight moons were figured. 13. When his shield was slit and his sword too broken, the asura hurled his spear; and that missile also, as it advanced towards her, was split into two by her discus. 14. Then the danava Nisumbha, swelling with wrath, seized a dart; and that also, as it came, the Devi powdered with a blow of her fist. 15. Then brandishing his club, he flung it against Chandika; cleft by the trident of the Devi, it also turned to ashes. 16. Then the Devi assailed the heroic danava advancing with battle-axe in hand, and laid him low on the ground. 17. When his brother Nisumbha of terrific prowess fell to the ground, (Sumbha) got infuriated in the extreme, and strode forward to slay Ambika. 18. Standing in his chariot and grasping excellent weapons in his long and incomparable eight arms, he shone by pervading the entire sky. 19. Seeing him approaching, the Devi blew her conch, and made a twang of her bow-string, which was unbearable in the extreme. 20. 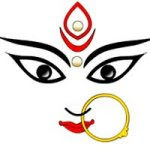 And (the Devi) filled all directions with the ringing of her bell, which destroys the strength of all the daitya hosts. 21. The lion filled the heaven, the earth and the ten quarters of the sky with loud roars, which made the elephants give up their violent rut. 22. Then Kali, springing upwards in the sky, (came down) and struck the earth with both her hands; by its noise all the previous sounds were drowned. 23. Sivaduti made a loud ominous peal of laughter, the asuras were frightened by those sounds, and Sumbha flew into an utmost rage. 24. As Ambika said, 'O evil-natured one, stop, stop', the devas stationed in the sky cheered her with the words, 'Be victorious'. 25. The spear, flaming most terribly and shining like a mass of fire, which Sumbha approaching hurled was, as it was coming along, put out by a great firebrand (from the Devi). 26. The interspace between the three worlds was pervaded by Sumbha's lion-like roar, but the dreadful thunder-clap ( of the Devi) smothered that, O King. 27. The Devi split the arrows shot by Sumbha, and Sumbha also split the arrows discharged by her, (each with her and his) sharp arrows in hundreds and thousands. 28. Then Chandika became angry and smote him with a trident. Wounded therewith, he fainted and fell to the ground. 29. Then Nisumbha, regaining consciousness seized his bow and struck with arrows the Devi and Kali and the lion. 30. And the danuja-lord, the son of Diti, putting forth a myriad arms, covered Chandika with myriad discuses. 31. 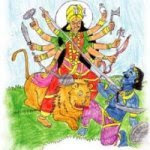 Then Bhagavati Durga, the destroyer of difficulties and afflictions, became angry and split those discuses and those arrows with her own arrows. 32. Thereupon Nisumbha, surrounded by the daitya host, swiftly seizing his club, rushed at Chandika to sly her. 33. As he was just rushing at her, Chandika colve his club with her sharp-edged sword; and her took hold of a dart. 34. As Nisumbha, the afflictor of the devas, was advancing with the dart in hand, Chandika pierced him in the heart with a swiftly hurled dart. 36. Then the Devi, laughing aloud, severed the head of him, who issued forth, with her sword. Thereupon he fell to the ground. 37. The lion then devoured those asuras whose necks he had crushed with his fierce teeth, and Kali and Sivaduti devoured others. 38. Some great asuras perished, being pierced through by the spear if Kaumari. Others were repulsed by (sprinkling of ) the water purified by the incantation of Brahmani. 39. Others fell, pierced by a trident wielded by Mahesvari; some were powdered on the ground by the blows from the snout of Varahi. 40. Some danavas were cut to pieces by the discus of Vaisnavi, and others again by the thunderbolt discharged from the palm of Aindri. 41. Some asuras perished (themselves), some fled from the great battle, and others were devoured by Kali, Sivaduti and the lion. Here ends the ninth chapter called 'the Slaying of Nisumbha' of Devi mahatmya in Markandeya-purana during the period of Savarni, the Manu. 6. Then all those, Brahmani and the rest, were absorbed in the body of the Devi. Ambika alone then remained. 9-10. Then began a dreadful battle between them both, the Devi and Sumbha, while all the devas and asuras looked on. 11. With showers of arrows, with sharp weapons and frightful missiles, both engaged again in a combat that frightened all the worlds. 12. Then the lord of daityas broke the divine missiles, which Ambika discharged in hundreds, with (weapons) that repulsed them. 13. With fierce shout of hum and the like, the Paramesvari playfully broke the excellent missiles that he discharged. 14. Then the asura covered the Devi with hundreds of arrows, and the Devi in wrath split his bow with her arrows. 15. And when the bow was split the lord of the daityas took up his spear. With a discus, the Devi split that (spear) also in this hand. 16. Next the supreme monarch of the daityas, taking his sword bright like the sun and shining shield bearing the images of a hundred moons, rushed at the Devi at that moment. 17. Just as he was rushing forward, Chandika split his sword with sharp arrows shot from her bow, as also his shield as bright as the solar rays. 18. With his steeds slain, with his bow broken, without a charioteer, the daitya then grasped his terrible mace, being ready to kill Ambika. 19. With sharp arrows, she split the mace of Sumbha, who was rushing at her. Even then, raising his fist, he rushed swiftly at her. 20. The daitya-king brought his fist down on the heart of the Devi, and the Devi also with her palm smote him on his chest. 21. The daitya-king, wounded by the blow of her palm fell on the earth, but immediately he rose up again. 22. Seizing the Devi, he sprang up and mounted on high into the sky. There also Chandika, without any support, fought with him. 23. Then the daitya (Sumbha) and Chandika fought, a never before, with each other in the sky in a close contact, which wrought surprise to the Siddhas and sages. 24. Ambika then, after carrying on a close fight for a very long time with him, lifted him up, whirled him around and flung him down on the earth. 25. Flung thus, the evil-natured (Sumbha) reaching the earth and raising his fist, hastily rushed forward desiring to kill Chandika. 26. Seeing that lord of all the daitya-folk approaching, the Devi, piercing him on the chest with a dart, threw him down on the earth. 27. Pierced by the pointed dart of the Devi he fell lifeless on the ground, shaking the entire earth with its seas, islands and mountains. 28. When that evil-natured (asura) was slain, the universe became happy and regained perfect peace, and the sky grew clear. 29. Flaming portent-clouds that were in evidence before became tranquil, and the rivers kept within their courses when (Sumbha) was stricken down there. 30. When he had been slain, the minds of all the bands of devas became overjoyed, and the Gandharvas sang sweetly. 31-32. Others sounded (their instruments), and the bands of nymphs danced; likewise favourable winds blew; the sun became very brilliant; the sacred fires blazed peacefully and tranquil became the strange sounds that had risen in different quarters. Here ends the tenth chapter called 'The Slaying of Sumbha' of Devi-mahatmya in Markandeya-purana, during the period of Savarni, the Manu.